I am pretty sure everybody is aware of the Mandrill changes at the end of this month. If you are one of the users dissapointed with Mandrill, maybe you are still looking for a service that can provide the same functionality at the same price (or similar). We have been reviewing all the posts and discussions out there and comparing most of the alternatives and we want to share with everyone what we have decided to use. Maybe you can find this useful and it can help you to decide where to move. Well, the list is big, really big. This is a great market and there are several good options to choose. Also Mandrill didn´t gave us so much time to prepare so we needed to cut the list a little. Because of this, we were not able to compare all of the services and we needed to choose some of them based on our previous knowledge and other recommendations on the web. We have selected 7 services to analyze and compare to select our favorite. Other services we didn´t compare can be find on the spreadsheet in case you want to check them. All of the services on the list replied to our emails or support tickets really fast so we were happy with all of them in this area. This is the document we have been using to compare the different options. I was inspired by this blog post but I feel there were some key features missing from that document so I decided to create my own spreadsheet. You can view the latest Spreadsheet updated here. Please leave any comments if you feel that the document has any mistakes or need to be updated. This screenshot has been taken at the moment of writing this post. Lets be clear, Mandrill was really good and really cheap, and on our research we just find out that indeed it was the best transactional email solution of the market and the cheapest! This makes are wondering again why they decided to do this movement, but it is time to move on and forget about the reasons. We have included Mandrill here because, despite it is going to be a more expensive option right now, it is still a great option for some users, and maybe the best move is to pay what they want and do not change anything on your app. For us, this is not going to be an option. We cannot forget how they did this, without any consideration to their clients. They have make clear that they do not worry about us at all. So, no matter how cheap are they, even if they were free at all, I won´t trust my business or emails to them. In fact I am planning to move all my other business (and some of my clients too) that I have on Mailchimp to another companies. Some will be hosted here at Sendy and others will move to other providers until we finish the RSS to Sendy app we are working on (If you do not know about this, just read this post and join us!). The trust is gone and that is most important than the technical details or the price. A great company with great features, but, they do not allow to send Marketing emails using their service, so this is a no-go for us at sendyhost. Their price is also a little higher than the other competitors on this list, but they have a very good reputation. So, if money is not a problem for you (cannot imagine how is that possible) and you only need a transactional email service, PostMark could be what you need. This guys were the first one to react to the “mandrill fiasco”. In less than 24 hour they update their pricing model and sent an offer of 100.000 emails for free. Yes, like that, their original price before the Mandrill move was 10.000 emails for month for free, and they just raise that to 100.000 emails. They have explained on the blog why they did it and how they can ensure this is not going to be an issue for them, but still I cannot be 100% sure they wont “do a mandrill” in the future because of this. Also, you need to be aware that there are some other issues with Sparkpost that maybe can affect your business. First, if you are using sparkpost for marketing AND transactional emails, you will see that Sparkpost add an unsubscribe header to all the email by default. This can only be disabled on the API, and not if you are using SMTP to send your emails (as a lot of Sendy users are going to try). There are several problems with this. If you are only using Sparkpost to send marketing emails, you will need to ensure that the unsubscribes that Sparkpost get through their unsubscribe header are received by your app too, using a webhook for example. This webhook does not exists on Sendy, so you need to create one yourself. If you are using Sparkpost for transactional emails, the problem is bigger because you do not want your users to unsubscribe to the “reset password” emails for example. Make sure you use the API and not the SMTP in this case. There is another issue we found on our tests with Sparkpost, and it is that the Sparkpost domain will appear as the sender on all the emails. It is not possible to whitelist their domain and use your own on Sparkpost. Some other features that (at the moment) are not available on Sparkpost (but that you had on mandrill and we consider them importants) are subaccounts (with different reputation levels), test mode, and the possibility to see the emails that have been sent. 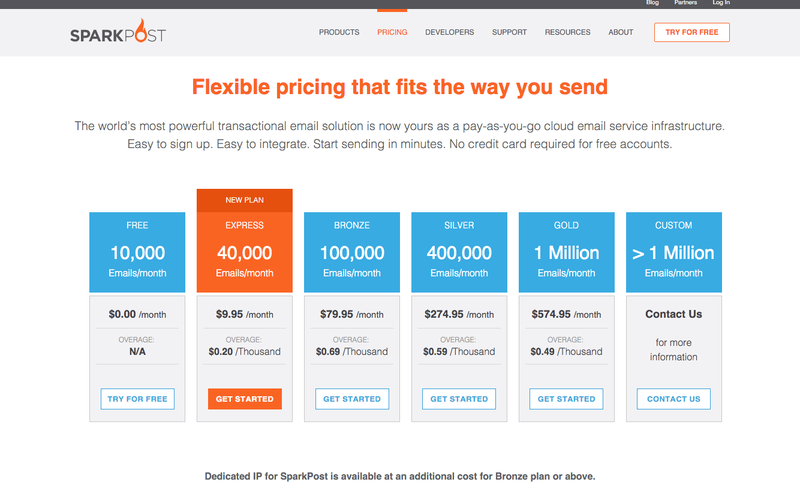 So if this issues do not concern you and the price is the most important thing, Sparkpost can be your solution. If not, keep reading (the best is at the end ;). Update 26-june-2016: Sparkpost has added the subaccounts to their offer. We hadn´t hear about them before this mandrill issue, and maybe you hadn´t either. They have a pricing model which is different from the rest of the contenders here. You only pay for the emails that are not opened. Which is a very good approach. This way they ensure that the people keep their list cleans and updated and the users save some dollars doing so, so win-win for everyone. They offer 25k on their free account and the price is also cheaper than the other services. The main issues we found with them was more on the technical features that they offer. You can see the details on the spreadsheet above, but we miss the subaccounts, the test mode, and the possibility to have multiple subdomains on the same account. The domain validation is made only using the main domain and they do not allow for subdomains validation, which is strange. At the end, we liked what they offer but it looks like that they have some space for improvement and we will be looking at them closely in the future. (Our webhook at Sendyhost works with Pepipost, so if you decided to use them, we are happy to host your sendy). I do not want to spend so much time talking about Amazon SES service as I am sure everyone knows them. The price is the best on this list and you do not need to pay monthly, so you only pay what you use. We know that the company is not going anywhere and that the service will work as expected. On the other side, they miss some key features, and they are really strict with their accounts. They have some limits on the sending limits by default, and you need to write them to raise those levels each time. It is said that some account can be canceled without notification and there is little that can be done to restore them. We never had any problem with Amazon, and if you are not doing anything bad, you do not need to worry about them. the thing we do not like about them is that you cannot monitor how good (or bad) you are doing. 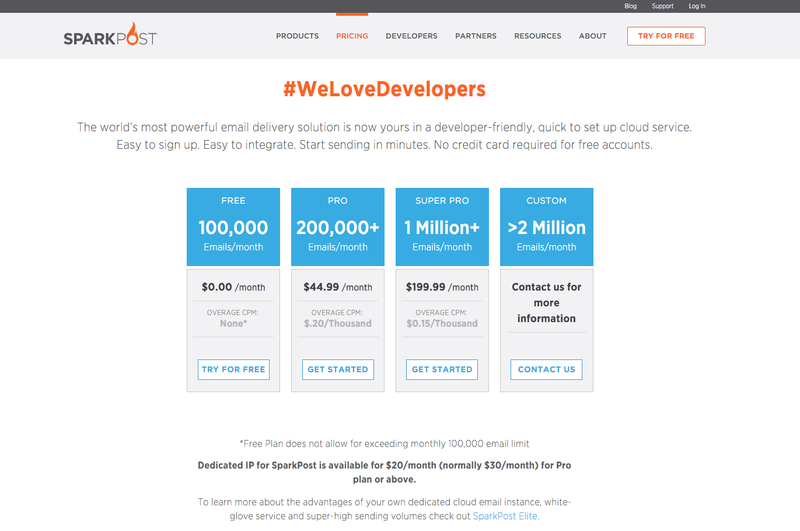 The key features they miss are similar to the Sparkpost service. There is no test mode, no subaccounts (but you can have kind of subaccounts using credentials), no reputation levels, and no whitelist of their domain, everyone will see that you send emails using Amazon SES on their Gmail and Hotmail inbox. The price is that good that they need to be on this list, it is one of the best options if you are sending millions of emails per month, when the numbers can be really important if you compare the different services. If you cross the line of 1 million emails per month, this should be your first option to use. I have left for the end Sendgrid and Mailgun, because they have been the best so far on our tests. We have been able to test all the different features they offer so we can write a little more about them and our experience. It is a well established company, they are not going to disappear tomorrow and they are not going to “do a mandrill” either. Their API is really strong and their documentation is great too, so it should be easy to move your app or service. Their price is not as good as Sparkpost or Amazon SES but it is good enough and they have a great reputation. The thing we do not like on the price is that they charge you by month, instead of charge you by use. Their free account allows you to send 12.000 emails each month for free, so that is good for a start and could be more than enough for testing their service. They offer great reports and stats on their website. You can monitor anything you need there. You can whitelist your domain completely and use your own domain for link tracking too. The WordPress plugin is great, and you should consider them if you are using WordPress (it works with MailPoet too). They do not have a test mode either (this one was the hardest feature to find on other services) but the other features are good. On the lower pricing accounts they do not offer subaccounts. They support multidomains but they do not recommend to use them without a subaccount. So, if you look the whole picture and compare with the other services, Sendgrid is one of the best options out there. When we first heard about Mailgun was several months ago looking for some nice templates for our Sendy install. And to be fair, when we start reviewing all the alternatives, we never though that Mailgun was going to be a finalist. But, we create the spreadsheet and we start checking all the features we needed and they got most of them, and the ones they didn´t, they have added them before we have been able to finish this review. So, for us, we think that Mailgun is the best alternative to Mandrill, let me explain you why. Lets start with the price. It is not cheaper than the others services like Sparkpost and Amazon SES, but it is the simpler one to follow, and that is good too. We do not want to do calculations to see how much is going to cost at the end. And it is important that they do not charge monthly, you just pay for what you use, which at the end will makes thing better too. The only other services that offer this are Amazon SES and PepiPost (and the old Mandrill). They offer 10k emails free per month. They have been around some time too so it does not look like they are going to close their business tomorrow. Their API is as good as Sendgrid or Mandrill, and the documentation is good too, so you won´t find any issues here. They provided stats and reports on their website, not as nice than the Sendgrid dashboard, but good enough (and you could create your own stats dashboard using their API). They do not support subaccounts but you can add as many domains or subdomains as you need and the reputation and all the data is keeped separate for each domain you have, so you can use different subdomains to simulate different subaccounts. We suggest you use a subdomain for transactional emails and another one (or more) for marketing mailing. They provide a test mode so any email marked as test will reach Mailgun but it wont be sent. Great for testing environments. Similar to the test mode we loved at Mandrill. You can whitelist your domain and your tracking links and you could use them as inbox if you need it for your app. On the bad side, they do not show the reputation on the dashboard so you need to imagine it (or contact them to know how you are doing). They use only one API Key for all the domains on the account, which could generate a big problem if you need to change it in the future. So as you can see we have been impressed so far with Mailgun and what they can offer, make sure you try them before you choose any other alternative. If you send more than 1 million emails per month, you should use Amazon SES unless you need any other feature that they do not offer. No one compites with them on price when you reach those levels. If you are below that, your two options at the moment should be Sendgrid and Mailgun, or maybe both of them. That is what we are using. We are using Mailgun for our marketing emails and Sengrid for all the transactional emails, and this is what we are recommending our clients and what we are using on our other projects. This way we also have a backup account already setup if we need to switch again from one service to another. What do you think? Which one are you using as alternative to Mandrill? Let us know on the comments. Did you review SMTP.com at all in your set of contenders to replace Mandrill? I’m contemplating. As I explain on the post, we couldn´t review all of them because of the short notice from Mandrill, so we choose from the ones we knew and move from there. Why do you think SMTP is better than Sendgrid or Mailgun? Yes, they added that as a request I made on their slack (with other people I imagine). The problem with Sparkpost is the two issues I describe on the post. Until they fix that, I cannot use Sparkpost for transactional emails. If you need test mode, Mailgun is the only one providing something like Mandrill. Thanks for this.. Mandrill’s test mode is unbeatable, thanks for the Mailgun tip on this. Does Mailgun offer CSS inlining? I am not sure but I think they do not. I have been trying yo test my developments and weebhooks with a new account and their system rejected my tests emails because a “Policy” that is not clear. It took them 7 days to reply my support ticket about it and they have not fixed the issue yet. had the exact same thing happened to me. They disabled my account without proper explanation. I recommend everyone to stay away. I know that, but when you use SMTP is normally because you cannot use the API. You wont be able to use the API on gmail, on thunderbird, on Sendy or in many other email software. So, imho, it does not make sense to have that option activated by default. It took 7 months to mandrill to change this several years ago as they had this setting when they started, but they did change it. I am sure sparkpost will change this in the future as well.